It Works! Wednesday! - Last Week to Get Paid to Be a Part of Something Huge! This is it! This is the VERY LAST week to take advantage of the discounted distributor kit for It Works! You can get healthy, lose inches, and make money! How can you beat that? 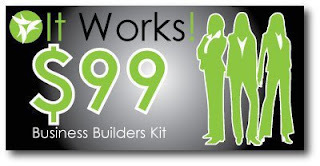 Sign up and turn $99 into $494 in a blink of an eye! I did it and you can too!! :) If you know at least 4 people who want to tighten tone and firm up an area on their body, lose weight, get healthier, or just feel better about fitting into that swim suit this season you have nothing to lose!!!! The rewards keep on coming and so do the health benefits! I have fun and make money! So you have until July 31st to sign up at the discounted rate! You get everything you would get at the full price so you make back your investment plus $100! What other home business pays you to sign up! You don't have to carry inventory and you don't just have to do home parties! Chiropractors, massage therapists, nail salons, spas, and even tanners can sell these products! The sky is the limit! To find out more about the products just check out my It Works page. Contact me today if you are interested in being on my team or just trying out a wrap! I love to travel!